The above info came from Jay, and was edited by yours truly (contact me). The image came from Web Wombat. Chihiro is a young, shy, quiet girl that moves to a new town (it seems to place near Totoro's tree house). Along the way, her father decides to take a shortcut to their new home, and instead of reaching their intended destination, they end up at an abandoned theme park, with a tunnel that leads into darkness. Her parents decide to take the tunnel down, and Chihiro follows them. On the other side, they discover a beautiful green valley, with abandoned homes. The parents investigate what looked like a boro, but completely dead. The father finds a resturant that is actually cooking food. With no one else around, the parents decide sit down to eat. Chihiro warns them that they might get in trouble for doing so, but they don't listen to her, and continue to eat. Chihiro then goes up to a luxurious building called a hot springs (onsen). As the sun sets, a boy named Haku warns her to run away before she is seen. She runs back to fetch her parents, but when she reaches them, she finds that they have turned in pigs! Chihiro then panics and runs away. Also, the valley is turned into a "ocean". Haku finds her and tells her in order to get her out of the world she is in and save her parents, she must work there. "Sen to Chihiro no Kamikakushi" is a wonderful film with many lessons, like don't pollute, greed, and love. 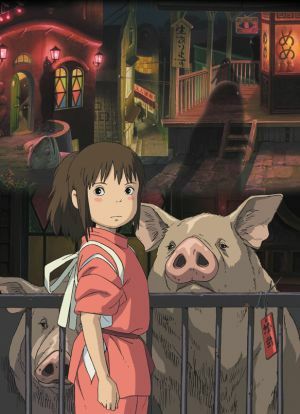 Spirited away is about a 10 year old girl named Chihiro, who never really liked adventures, or moving to new places. Then, when her dad decides to take a short cut to their new home, little do they know that they accidently 'crash' into a tunnel that actually leads to another world were spirits exist. Then, when they try to find some people, they eat some food from a restaurant, which Chihiro refuses to eat. When it gets dark, she finds her parents were turned into pigs! She is lost in another dimension, loses her parents, makes friends with a spirit named Haku who lost his home, and signs her life to a crazy witch named Yubaba. And unless she can find her parents and remember her name, she is forced to work for Yubaba... forever. But, above all Spirited Away is a great movie, and is one Mr. Miyazaki's academy award winning films ever made.